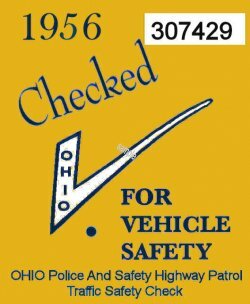 1956 Ohio Safety Inspection sticker - $20.00 : Bob Hoyts Classic Inspection Stickers, Add a Final Touch to your Restoration! This 1956 sticker was issued when a roadside inspection turned up bad equipment. When the owner repaired the flaw the garage placed a sticker on the car. The sticker was also issued by car dealers to show the car you were buying was safe. This 1956 Ohio sticker was carefully restored both front and back from a very nice original. For an additional $10. we can add your license plate to the front of the sticker and remove the serial number. It has our patented "Peel and Stick" format which allows you to place it on the inside of your windshield.